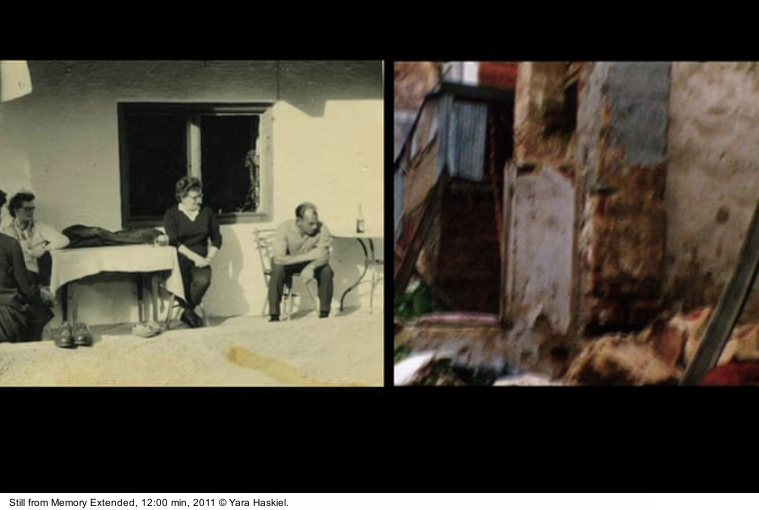 Mario Margani: Tsakalos Blues – one of your two more recent long video works, starts with a quote from Jiddu Krishnamurti: “The observer is the image looking at the image, which he has created about the other. The relationship between the observer and the observed is not a relationship. It’s two images looking at each other. If the observer has no image at all, which is quite a tremendous problem, which is meditation and all that, then the observer is the observed. What is, is the observer”. Towards the beginning of your more recent film I don’t write Diaries I & II, On Love and Crisis and On the Power of Fragility (2016) your address a similar topic. I quote your words here: “I think you are rather not a filmmaker. You carry an image of me. I carry an image of you. I think we started to make a movie. Maybe you do something else. Who knows”. Yara Haskiel: I used the part by Krishnamurti because it is an announcement to the audience. Somehow it also gives the reflection. The observer is the image. Two images are observing at each other. It addresses the audience and it gives this kind of reflective moments. And this is what I try to do a lot in the Diaries. I try to kind of involve the audience and the observers, and somehow to draw them into the works as if they were my friends or brothers and sisters. 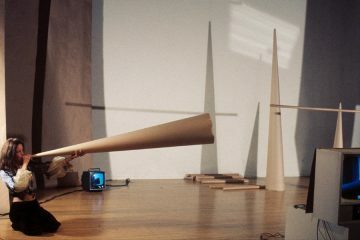 I think it is a sort of opposite to filmmaking or video-art making, which implies often strategies that produce a distance between the onlooker and the maker. All my works are very personal and even a tool for healing or understanding things for myself followed by the wish of transferring these searches to others. I think many people have problems with that. 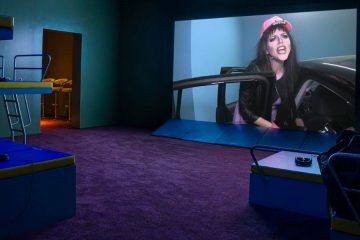 In Germany for example, we have a video art and experimental film tradition that is built on generating distance. I precisely don’t want to do that, because I cannot correspond to that. Mario Margani: Now I have a couple of technical questions about the Diaries (I don’t write Diaries I: On Love and Crisis and I don’t write Diaries II: On the Power of Fragility). 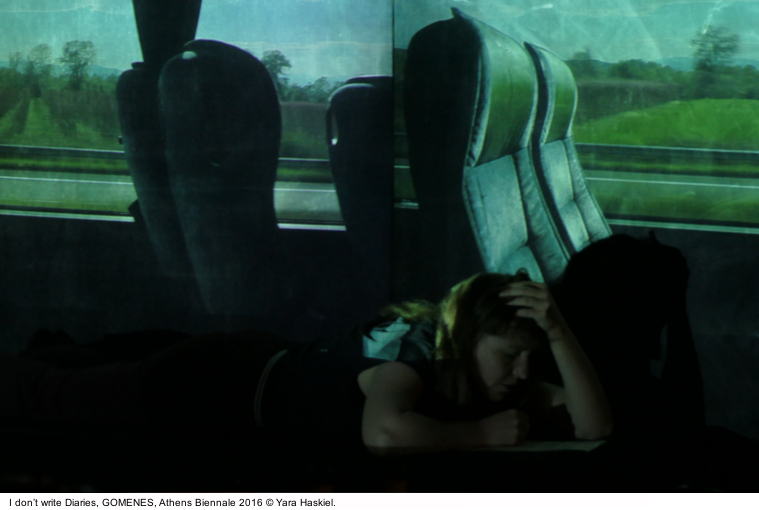 You have sent me the video-documentation of your performance in Athens. A live video-text montage where you are reading aloud a text while lying belly down just beneath the projection of the Diaries. Is the same text of the two movies? Yara Haskiel: It is the same but a bit modified, and there are some passages that I reused. Mario Margani: How happened that you transformed it into a performance? 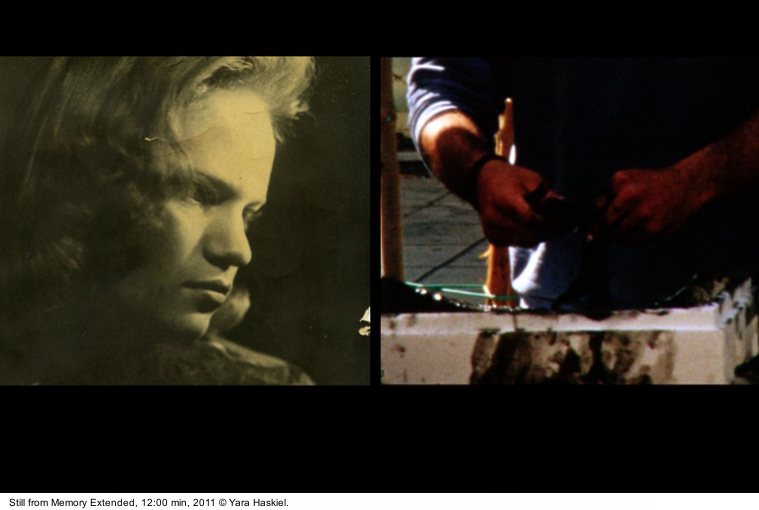 Yara Haskiel: It was an experiment for me. I decided to make a live mix of the raw material, a pre-edit of the material. I had at the beginning only the first diary, 15 minutes. Then I continued to work on it, and it came around 30 minutes. The second was not perfect. Then I got invited from the Athens Biennale in 2016 from Rilène Markopoulou and Eva Giannakopoulou, the curators and initiators of GOMENES, a performance art project on Gender and Stereotypes. It was a 5-days performance program with artists from Austria, Greece and other countries. They invited me to do a performative format of the Diaries for that. So I decided to make a live video mix, with two laptops, two pre-edited videos and two channels. I wanted to experiment how this could work. I thought it would be nice to make an introduction and I decided to put my body on the screen cause this was also an image that I was using a lot in term of performative strategies. So I decided to put my body in the videos and to multiply it in the performance. Mario Margani: Do you see the two films like two chapters running parallel? Sometimes they overlap and have the same pictures, but they also have two different titles. Did you develop them at the same time, working on both in parallel, or you finished first one and then moved to the other? Yara Haskiel: It’s an open format. When I have tried these technics with the voiceover, text writing, generating dialogues and assembling quotes and stories that I had collected, I found out that it could be very much an open collage. It could be rearranged in various manners. I really want to continue with these approaches. Right now it is in the state where it’s a kind of two-channel projection, which can also be screened split. I figured out that it is a good choice to work with two voice-overs. It is not always perfect but it works because it doubles the psychological states, the experience and untranslatability about experience. You can mirror this in the different voices and in your head and sometimes in the situations where you feel placement and displacement at the same time, or when you feel love and rejection at the same time. In this fashion I have the possibility to overlap experiences and feelings also through voices and not only through pictures and montage. Mario Margani: The visual material is from Greece and from Barcelona. Are other places involved? Was related to the place where you used to live? Tsakalos Blues seems in a way to be your father’s diary. Both this and the Diaries are not diaries in the strict sense but they are at least connected to the places, and to your and his experience of life and work. 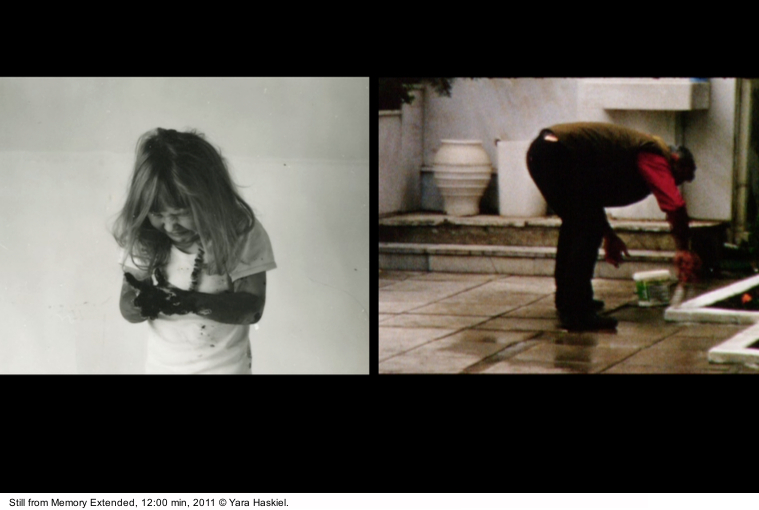 Yara Haskiel: The footage is from Barcelona, Berlin, Greece, France, Israel and one shot in Italy, Milan. Mario Margani: In the Diaries there are two focuses. But since they the two parts often overlap (Love and Crises and The Power of Fragility), I have found in both an attention to the autistic approach to life and how to disrupt this, or how you experience this. It looks like this precarity has an ambivalent power, because it gives the chance to escape some structures and to build your own structures, although often only temporary. But it seems to me that it imposes a detachment from involving in any relations, which would make a life less precarious. Or it produces even a fear to involve in personal relations, love or deep friendship relations. In some passages you talk about the fragility as a resistance, but I can also see this fragility as a precarity in which you cannot really choose what to do. 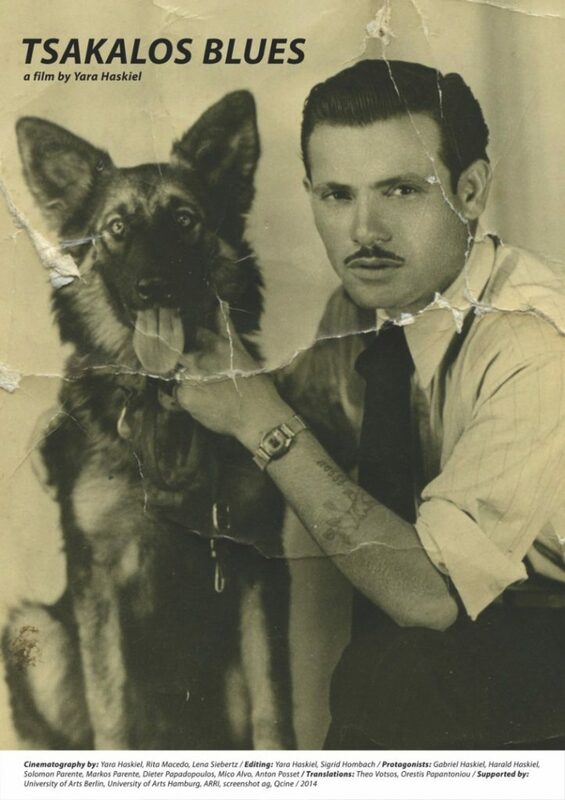 Then you have to follow the events and the chances, maybe as your grandfather did. And it can also lead to situations where you do things just to make a living, but where you are often not really happy about. How do you see this ambivalence? Yara Haskiel: First of all, there is a major difference. I was part of the independent study programs at the MACBA with Paul B. Preciado as a head at that time, and it was very important for me to be able to read a lot of stuff and to study again theory, because in art school you have a different approach. It is crucial for me how Judith Butler describes precariousness: you can differentiate the terms “precariousness” and “precarity”. Butler says “precariousness” refers to the general precariousness of being vulnerable as a human being. And she pretty much refers this to circumstances of war and pain, where humans are vulnerable. “Precarity” refers for her more to a kind of new form of power structure that comes after the post-Fordism, and with the changes in the condition of labour, seen as an experiment to keep people governable. In this sense you can also refer to Foucault and how the system functions. We live in precarious condition and because of this we “re-precarize” others on our own since we work in the cultural market and art market, where we have problem in paying somebody working for us even less money. It is a form that makes people more governable. This precarity is a notion that can be projected into the future. It affects strongly our approach towards the future. It produces a sort of blockade. For example when I know that I won’t have enough money in two months, I have to cut expenses and I kind of block myself. It belongs to a power system of condition of how to subjugate people in terms of how to make them governable, because they are becoming fragile out of this condition. My idea about the power of fragility comes from the awareness that we are coming to a new state because this precarization has a lot of effects on our psychological state: increasing depression, sicknesses, anxiety, and self-worth problems. You don’t feel to be good enough doing a work, and still being available 24/7. And fragility in that sense is ambivalent because if you are in this fragile position you constantly have to rethink and reflect how to create other options, to manoeuvre yourself or balance your way through life. You have to reflect how to create alliances and social networks, and what kind of social grid is important to you in order to not get depressed and feel more stable. But that also refers to me in terms of a rethinking of society and about social networks. Fragility brings you into a state of being more aware. This vulnerability can actually become a strength, because you are trained by the circumstances to find solutions and approach problems in a different way. Mario Margani: Let’s say that a person under precarious life circumstances has to develop a consciousness about all of this. Yara Haskiel: And this refers also on another level to a feminist thought, or to a lot of thoughts that go into the rethinking of reproductive work and rethinking what does it mean to do care work. We have to shift towards autonomy but we need to rethink what autonomy means: to be more caring and careful with our social network because this precarity bring us more existential problems and tends to detach individuals from their real social bonds. We need to nurture different ideas about how to think collectives and about how to live together through care practices. This was my basic thought while working on the Diaries. Mario Margani: Are you also trying to develop a kind of visual language for fragility in your works? In the Diaries you use a lot of video material from many different situations. In the first three minutes we see: a view from an airplane, a bed, a waiting room, private photos, you dancing alone, a terrace on the seaside in Crete, a house in the countryside, something looking like a seesaw, then you are running or walking faster. Some of these actions or places gave me an immediate sense of precarity. Some movements produce an unsettling view for the onlooker. Many places have no personal connotation. We only see you once sitting in a car with a friend. We face at the beginning a strong emptiness. When you appear you are alone or if there are any people, you don’t have any personal connection with them, like in the waiting room. Are all of these possibilities to translate the fragility and precarity into a visual language? Yara Haskiel: Yes, there were some decisions that I took in relation to that. I thought that when I work about precarity, crises, and love and all this problems, also the image should be precarious. I allowed myself to use a low-quality camera. I decided to make pictures with my phone. I took the decision to put all together and to avoid a formal strict selection. It is a formal decision but for me it was clear that this was the only radical thing to do. And then I also decided that there was not a fixed place, but different places, being displaced or being between places, which make you more fragile. You can translate this state into a psychological state, to a kind of self-imposed mobility in these situations and times, a self-imposed exile, that of course has a lot to do on the other side with the precarization of labour and the instability in personal relations. You can make a workshop there, an exhibition there, and something else there. You have often to pay the travel on your own but you have to go there. You want but at the end you also have, you have to be flexible, you have to be mobile. In the Diaries I try to mirror this fragmentation of time and places. You not only have to be mobile, you always have to have your computer with you in order to be able to switch to another work or to another virtual or real place, and actually in order to be everywhere you are just nowhere, only between things and places. This is a displacement that many people are in and it affects them psychologically, it affects their relationships. Mario Margani: The translation of this fragmentation into a visual language or approach is for me very interesting. Developing a visual language for this brings you to the necessity of using a different approach, to avoid some trite formats, like the official languages of the big narrations, the rhetoric of the institutional, where small private stories often disappear or have no space. They are ironed out by great or allegedly more important stories. And this story telling deeply affects the “history-writing” (Historiography). In order to try to understand these private, personal stories then you have to use another language. For sure there are also artists and directors trying to show and tell these personal stories for the broad audience using a visual language, which has an institutional mood without being yet institutional. Also this more common approach most of the time doesn’t reach the point for what it is meant to be done, since it is conformed to the format of the official narrations even before becoming it. In order to be accepted and acceptable for the institutions personal stories often becomes something else, in order to be fit for being adopted in different situations, museums, festival and others. The fragmentation you try to translate in the Diaries makes your life harder on one hand, because it is less easy for the viewer to straightforward follow what you are saying. It requires a very attentive viewer, but on the other hand it is just nearer to the subject you are confronting the viewer with. Yara Haskiel: But it is also referring to the way we perceive media right now and in these times. I’m trying not to overwhelm and overdo this, but it is also about how you perceive images and reality after the invasion of digital devices in the day-to-day experience. How we live with our phones and technological stuff. That’s why I also use the words of Franco Bifo Berardi in the Diaries. He is precisely talking about these autistic trends and lost of empathy connected to the pervasiveness of digital communication. In addition to this comes the velocity, the accelerating factor that Paul Virilio addresses in his writings. This acceleration changes our perception while entering in our bodies, and produces a loss of empathy with people, through digital communication and through our new relation towards technology. My use of broken time-lapses in the Diaries refers on one hand to this sort of fragmentation, but on the other hand through them I try to mirror the process of the video editing itself. The approach is very reflective to the medium and to my position in it. I think that’s why I’m not a purist. And I guess there is a problem with it in Germany especially. I mix various material and formats and try to find different languages that more correspond to our psychology and to our scrambled perception of reality. Mario Margani: Did you have any bad experience in the past with the German public? 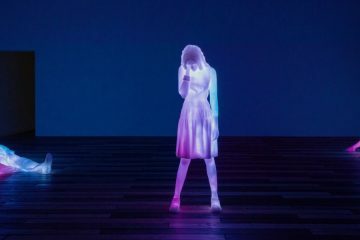 Yara Haskiel: I had quite a few problems with public in Germany telling that my visual language, my form, is not “stringent”, not consequent enough. Other publics have very often a totally different perception of my works in Greece, Spain, Italy, and even in England. They accepted it and feel engaged and questioned. Mario Margani: I don’t get this critique. 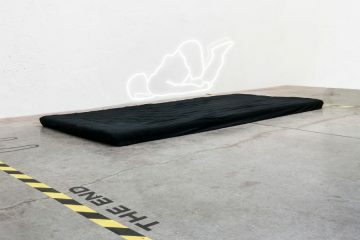 I didn’t pronounce the word “consequent”, but it connects well to what I was telling few minutes ago about artists finding a way to deal with the mainstream in order to show and tell private, sometimes allegedly secondary stories into an institutional frame, adapting their visual language to an institutional form. This is the approach I consider not consequent at all, because they feel the necessity to “translate” their language in order to be accepted and to enter a broader circuit of festival and biennials, but most of the time losing their initial disposition towards the people, the situations and stories. So actually I would say, you are more consequent, if you see in this way. But maybe your critics meant “consequent” in another way, more connected to linearity in the story telling? Yara Haskiel: Exactly, but none of my work is very linear. 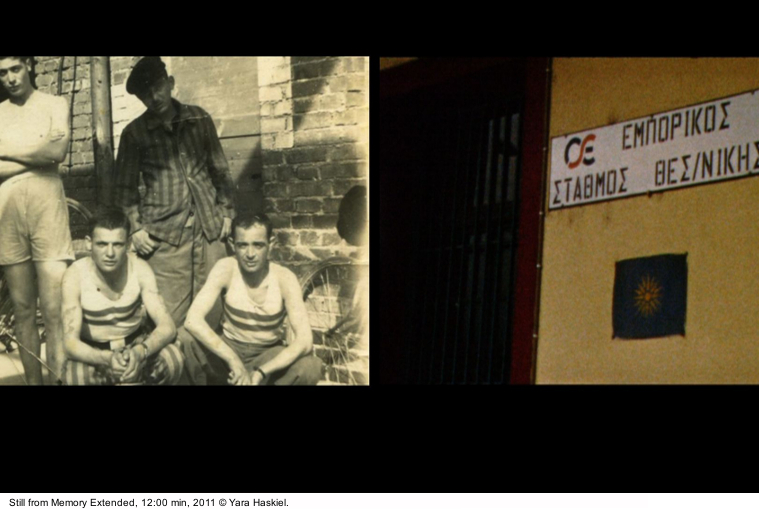 Mario Margani: The work Memory Extended, done before Tsakalos Blues, is like a preamble to it. With you not being able to find any real information and documentation for your story. You visit a couple of archive and you meet a person in Thessaloniki, and he says that most of the material from the archive is lost. Is that another work or is a preparation to Tsakalos? You show it alone or together with Tsakalos, or you don’t show it at all now? Yara Haskiel: It is a different format. That’s why I’m looking for how to develop these different formats. I did this piece as a diploma work. And it was the first time I was working with poetry, from Gertrude Stein. Poetry is something that creates a lot of desire. I feel I can use the strategies of poetry for getting strength in working with imageries. 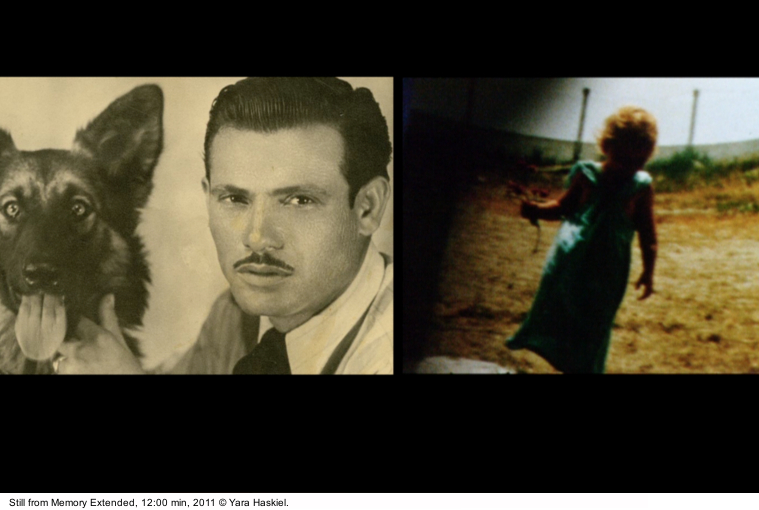 Memory Extended was mainly shot on Super8 in Greece, and mixed with photographs from my family. There I deal with the gaps and I edited a lot of short black sequences inside. Nobody likes my blacks, but I don’t care, I need blacks. Mario Margani: I don’t think it is even a thing to like or not. It is just part of the structure of your film. Yara Haskiel: Yes, this is really part of a strategy to show the blacks, the gaps in the story of my family. It is a very decisive point when I use that. It is not to avoid an edit or a cut. I think I’m actually still at this point. I’m making another film project now and it will also be about these gaps in a certain sense. Memory Extended was a two-channel installation, a clone work. It was material that I developed in Tsakalos Blues, and I used also part of this material for the Diaries. I’m reusing my material pool also, very often. Mario Margani: At some point in the Diaries you are quoting an author about the issue of belonging. You start saying: “Belonging is this, is that, and at the end belonging is important, without depending”. And then this goes on for several minutes. It is embedded in the context about the fragility or precariousness. I’m wondering if belonging in your approach can be the only safe harbour to find something which you can still have a relation with, a part from experience a totally precarious life. Is it the only way to go further in life, having something to belong to, a social group, a person, or a place? The question is if belonging builds up an identity, which makes you depending to this in the eyes of the others. Let’s take me as example. 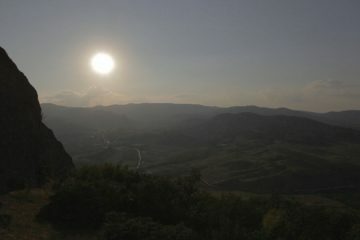 I’m from a town in Sicily, Enna. I live away from that region now for almost the half of my age. I belong to Sicily sometimes, but it also makes me feel strange when I see through the eyes and words of the others that I depend from this, meaning that my way of living is for the others very connected to a place and a time very far. It also looks more as a comfortable frame for the other, to understand me or what I do through the frame or the filter of my geographic belonging, which is a part of what I am, but definitely not the only part, and sometimes it doesn’t even play a role in what I do. 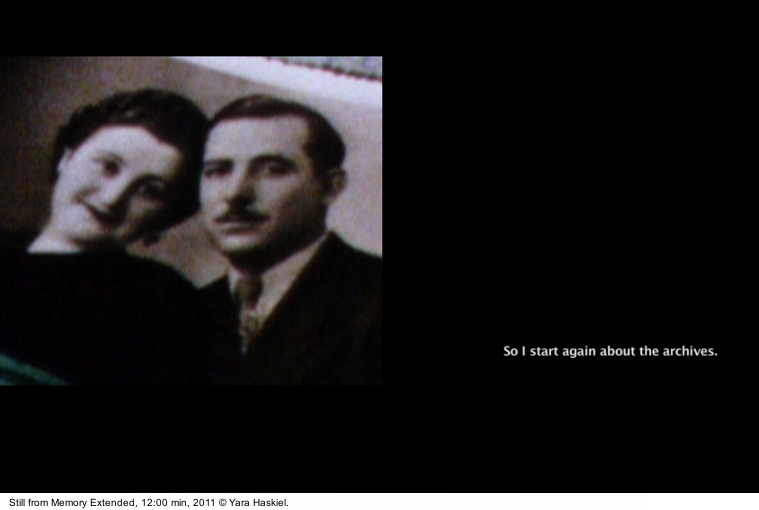 Yara Haskiel: I have made some footage there and I re-modified them also in part. It says at some point “you don’t want to be dependent”. It is a bit ironical. In relation to the thoughts from Marina Garcés, Judith Butler, Bell Hooks, and many others who wrote about this, there is a dependency. We are dependent on each other, because we are precarious. We are social. We can only be dependent on each other. So it is not possible not to be dependent on each other. You are dependent on your mother or father, and at a certain moment she/he is going to be dependent on you. And you are always dependent on a social environment, cause it cannot be other then this. In the video it was about being ironical with the idea of trying to be independent anyways. And that’s what feminists are often approaching in their theories. We are dependent (for example to a community of chosen family) and we have to find the way to approach this dependency not as a negative thing. Of course when it comes to relationship, to love or whatever, it can become co-dependency or you can get dependent in a way that is very destructive. But that’s not what I meant whit it. And with the belonging, I try to say that also in the terms of Guattari and Deleuze. Today the will to find exactly your peers, or your place into the world, can go towards very different directions according to time and situation. It is kind of completely open. So when you fall in love with a person, you fall in love with a whole world. And you like to be part of the construction of this world, so you need a point of reference that can attach or be part of it. Desire, can become quite negative or fatal also. My work is mainly related to pain and trauma, like a tool to elaborate painful or problematic experiences. And of course lots of female and feminist artists tried to approach very personal feelings, exposed and worked with their bodies and experiences to liberate themselves from patriarchal society, constructs and gazes onto their bodies and subjectivities concerning gender/race and class in the 1970es and even before. And it is not meant in terms of identity. Take Mezzadra’s, Papadopoulos’s, Tsianos’s and many other writers of the “Autonomy of Migration”. Maybe now it’s a very difficult issue to address in the same ways due to our situation and times, but we have to rethink that notion. It was very important for the political group Kanak Attak, of which I was part of the last generation in Hamburg, to really state that we didn’t want to have this image of the victim, we didn’t want to reinforce the notion of identity, but we wanted to talk about the tools that construct a different intelligence out of this. And that is the mind-set I feel that I belong to for example. And I’m very grateful that I was able to study with Hito Steyerl, Angela Melitopoulos and Heinz Emigholz. I really appreciate for what I’ve learned from their sharpness in terms of critical art and documentary from the margins, post and de-colonial theory, activism and experimental cinema. Mario Margani: You have said that you are working now on a new work. Is it going to be related again to this fragility and the precariousness which was very present in Tsakalos Blues and which you developed further in the Diaries? Yara Haskiel: I will try to combine the techniques and experiment anew. And it will have something to do with wisdom of ancient goddess powers, ancestry and necropolitics.